I promise that I tried my best to have fun with the Metal Gear Survive Open Beta. Most people have hated this game since its announcement and, frankly, I understand why. The game appears to be a cash grab. 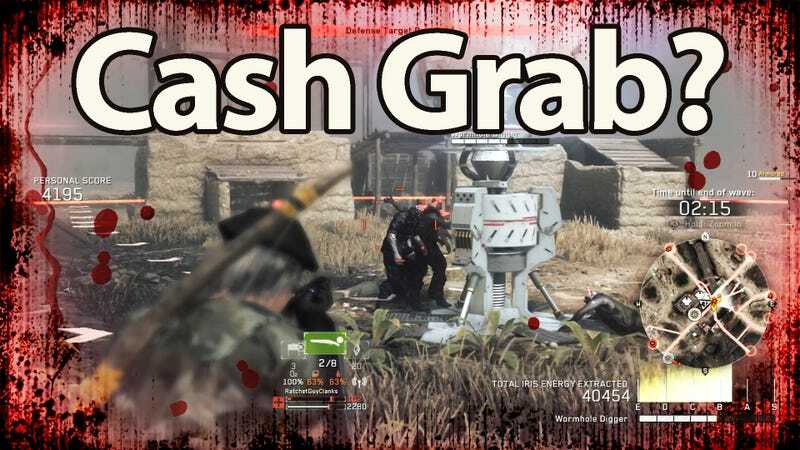 From similar weapons to reused assets, the Metal Gear Survive beta feels more like a fan made mod to The Phantom Pain rather than a standalone game at times. Unfortunately, using assets from The Phantom Pain does not help this game at all-sometimes it even harms it. I want to discuss my thoughts on the Metal Gear Survive Open Beta and why I am not optimistic for the game’s full release. I played the beta for around an hour and a half and found many things that I did not like about the game beginning with melee. You start off with only melee weapons which forces you to rely heavily on them at the beginning. The main problem is that the melee combat is extremely unreliable and uncomfortable to use. When wielding a weapon such as a large hammer or axe, your character will swing in random directions. Sometimes the character will bring the weapon downward onto a zombie’s head or in a slashing motion. This can be annoying, however, when there is a wall blocking the weapon. Whether it was a low hanging ceiling above her or a wall beside her, my character would constantly make contact with obstacles. She would sometimes even hit an obstacle when every other direction would be free of any blocking object. Hitting the environment would cause her to reel back and allow for a zombie to land a blow on her. It would be helpful to be able to control the direction of her swings. I am not asking for a mechanic similar to For Honor’s directional swing mechanic (although this would be awesome), but I would at least like for the character to be smart enough to realize if she is about to strike a wall instead of the killer zombie in front of her. Thankfully I was able to attack this zombie with ease. The other annoying part of melee combat is the ability to stealth kill a zombie. Just like in Metal Gear Solid V, you sneak up behind an enemy and press the button prompt as it appears on the screen. This will allow you to kill an enemy in one blow in Survive. Again, there is a huge problem with this mechanic as the zombies move more sporadic than the normal enemies in The Phantom Pain. Pulling off a stealth kill on the lumbering explosive zombies is vital, but can be frustrating to pull off as the button prompt appears and disappears when you are within a certain distance to the zombie. The melee prompts are not always accurate, but I was able to pull this one off on the Bomber zombie type. Even if you are closely behind the zombie, this prompt does not always appear or does not always work even if it does appear. This was a mechanic geared more toward the static or patrolling enemies of Metal Gear V rather than the zombies who will move in 360 degrees in a matter of seconds. This mechanic just doesn’t work well for Survive. Being able to achieve a stealth kill by just being behind the zombie and pressing the melee button would be much better and more reliable. Interacting with objects can be a pain, unfortunately. Speaking of the accuracy of actions, I had multiple moments where I would try to interact with an object, but I would choose to move a little as I did so. This would cause the button prompt to go away-forcing me to turn back toward the object. This happened so many times and would be frustrating as this can be such a fast paced game at times. I would try to hurry and mount a turret by holding down the prompt before the zombies descended on me. I would almost have the prompt completed, but I would then accidentally cancel it because I barely moved to the side. I feel that this system of holding down a button for an extended period of time is frustrating because it acts the same way that the stealth system works where you have to perfectly face what you are interacting with. Being able to just get on a turret or interact with something in the environment should not be such an arduous task. In a fast paced game, all actions should be relatively fast paced to match the game’s atmosphere. If you have to hurry and kill scores of zombies before they destroy what you are defending, the game should offer ways to quickly combat the horde. I feel that the difficulty of fighting is mainly attributed to the clunky mechanics rather than the skill of the enemy types. The game’s core controls fight you more than the zeds do. I would like to see the game lock you into the button prompt so that you can not cancel it unless you choose to release the button. Or I think the game should simply shorten the prompt. Either way, the mechanics need to be fine tuned in order to feel more responsive. Access to the single player portion was not available, unfortunately. One thing that I want to mention is that I played the beta as a solo player. Unfortunately, the beta was catered more to a co-operative audience. This meant that I was severely limited in what I could accomplish in the beta. Thankfully I was able to play the cooperative mode solo, but the zombies did not appear to scale to the number of players like they do in a game such as Killing Floor 2. I found myself having to cover six or so different directions at the same time on the easy difficulty setting. It felt unrealistic that I would be able to succeed in the game. I did have somewhat of a chance, but there were many times where I felt that it was practically impossible to cover every direction by myself. I would like for this mode to offer more ways to play if you are a solo player such as myself. And, for the beta, why did they not include access to the single player portion of the game? I would assume some portion of the game is finished since the game is so close to being released. It would have been nice to include the first thirty minutes or so of the game. Or, at least include a matchmaking option. I did not see the option to just play the coop mode with strangers. This feels like a serious problem, and one that should be fixed before release if it is not already in the game. The only way I could access all of the options was once I restarted the game. While they are at it, please let me access the options from within the game. Why in the world can I not adjust options such as sensitivity, inversion, audio, or video settings from within the game? You literally have to close the game, restart it, and then access the options from the character selection screen. This is pointless for options such as sensitivity as you need to actually test the sensitivity out to see what feels best. I have never seen a modern game not give you the option to access settings from within the game. One good thing that I want to mention (yes, one good thing) is that I like how in between waves there can be an optional side quest given to the player. The quest I was given was to recover a box of ammo guarded by two mini-boss-type zombies. This could be interesting in co-op as some players could choose to build fortifications while others seek out the ammo that can, presumably, benefit the entire team. This may add an interesting element to the formulaic gameplay. Before I wrap up this video, let me throw out a few more problems. These are other issues that I noticed that do not need much explanation. The first is that I feel that there is a lack of basic tutorials in the beta outside of some written messages. It would be nice to be able to have a training area to understand how the game works. The only option for training that I saw was in the interactive menu (which is kind of interesting, by the way, but confusing), but all the training area offers is static targets to attack which is fairly pointless, in my opinion. I assume the single player campaign acts as a tutorial, but, since it wasn’t in the beta, I had to jump in somewhat blind. Also lacking are easily discernible visual cues on screen. There were multiple moments where I was confused as to what an item or object accomplished. I would have liked for there to had been more explanation as to what mechanics that are only found in this game accomplished or blunt messages that quickly portray a gameplay mechanic. The ammo that I received from the optional side quest resides near the wormhole digger as a restocking station. I returned to it for more ammo, but it went away after two or three uses. I didn’t know this was the case because there was a long string of text describing what it did, but within the text was the fact that there was a limited amount of uses available for the ammo restock. I am glad that it did tell me, but I am not going to take the time to read this as the timer is counting down for the next wave to begin. I think it would be better if a simple “1 of 3” appeared above the station to give me the hint that I am using one of my three chances to restock or there is one chance left. Another set of problems are with placeable items and equipment such as barriers and turrets. As you use a turret, it will begin to lose health rather than ammunition. In Gears of War’s horde mode, turrets will run out of ammo but remain on the map unless destroyed by an enemy. This will allow for you to return to the turret and restock it. In Metal Gear Survive, it would continually lose health as I used it. Maybe there was a way to repair it, but I had no way of knowing if this was possible from the information on screen. It would eventually blow up because of my second problem: all placeable objects within a certain radius of the wormhole digger will be destroyed at the end of each wave. Why this happens, I do not know, but this would also be frustrating as, again, I had no way of knowing this would happen until I lost all of the barriers and other crafted objects that I had placed within the radius of the digger. I like the implementation of looting in between waves, but the resources available does not seem to be worth the effort. Spending your time building defenses would probably be more beneficial since the majority of resources are items such as wood or other basic items that will only allow you to build the simplest of defenses. The optional side mission will net more rewards, but looking for trees or other crafting materials does not seem to be the best way to spend your limited down time. Healing is a very important aspect of most games, but in Survive it is too convoluted. You have healing items that you can use to refill your health bar, but, even after I am back to full health, the blood status effect on the screen continues to appear. This may be a glitch or maybe I have a more severe injury (this does not appear to be the case, however). Either way, I am not sure as to why this was happening. I also found the lack of ways to heal to be a pain. I assumed that looting in between waves would allow me to find healing items or materials used to craft medicine, but the herbs that I gathered could not be crafted into any basic medicinal item. It would be nice to be able to at least craft basic bandages in order to heal. Maybe this is a gameplay mechanic, but, either way, it would be nice to be able to have some way to heal more frequently. Your health does slowly regenerate in between waves, however, which is definitely helpful. Another random thing to mention is that you will occasionally be granted items such as healing items and revival pills in your mail. This is great to have as a new player, but one annoying aspect of the mailing system is that it does not automatically equip these items. You have to manually equip a revival pill which does not take up an equipment slot (as far as I could tell, at least). Why would you have to bother doing this? I could not find how to equip these items after spending a few minutes managing my equipment. This is yet another frustrating and pointless addition to the game that I can’t wrap my head around. I want to also mention that when interacting with the crafting bench, it will show you a list of items you gathered prior to using the bench. This list does not show up in the empty space to the right but appears right on top of the menu controls needed to access the crafting menus. The timer would be counting down to begin the next wave, but I just had to wait for it to give me a list of items which I already knew I had. The report is covering the entire menu. This does not need to appear, but, if it has to, why can’t it go to the right side of the screen? And the final thing I want to say is that the character creator is actually pretty decent, but it appears to be ripped straight from Metal Gear Solid V. But, this is true for the majority of the game and why I think that this game is a cash grab. A majority of equipment, buildings, and environments appear to be ripped straight from V, and the game just kind of goes with it. I personally think that the beta proved that this game is nothing more than a pachinko machine mark II and offers little originality or reasons to give the full game a chance. I hate to see a game fail, but I hope that the shortcomings of Metal Gear Survive will be a lesson to game developers and corporations in the future. Hopefully Metal Gear’s future entries will be treated with more respect and detail.